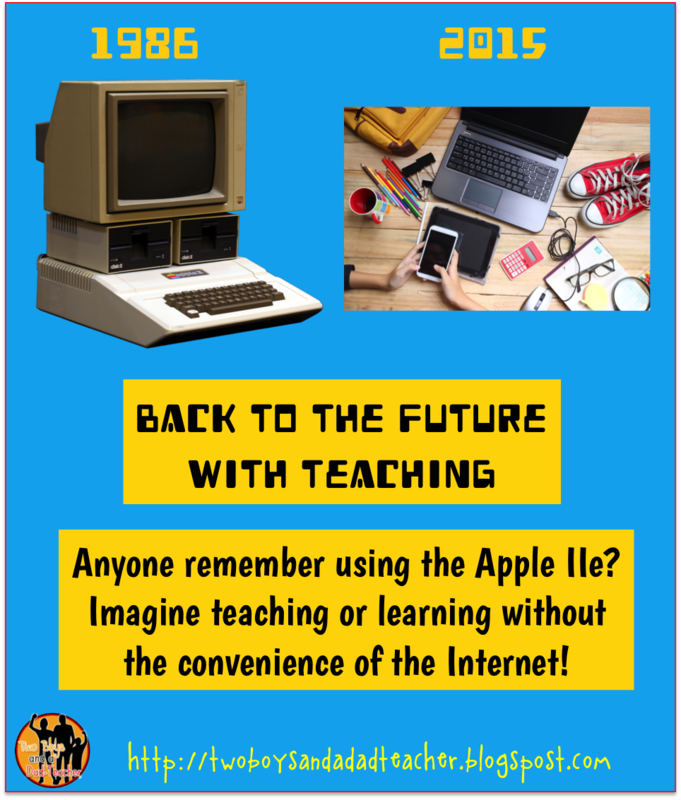 What was different about teaching 30 years ago? It was definitely more relaxed and more fun. Let’s do some compare and contrast. Teaching was a lonely profession back in the day. I know many of us participate or are part of PLCs, data reflection sessions, Lesson Studies, and any other form of collaboration that administrators can think of to include us. But travel back in time with me to 1986. The only collaboration time we had was when you passed another teacher in the hallway during recess or sat with a friend during lunch. Or maybe after school walked over to a colleague’s room to ask a question. Teachers never planned together, teachers never discussed data together, teachers never collaborated together. We worked in isolation, not knowing what other teachers were teaching or doing. How times have changed. When I first started teaching, there were no state standards. I don’t even remember being handed any expectations of what students were expected to learn! Instead, I just tried to remember what I learned in that grade level and taught it. Then in the 90s, the California Content Frameworks appeared and now we had expectations about content and what was expected to be learned at each grade level. When the California Standards were given high emphasis in the early 2000s, then we knew EXACTLY what we had to teach because it was going to be tested on the state test. And now, California is a Common Core state. Yes, I do agree that we need to have national standards. I just don’t think we need a standardized test to go with it! Have standards made it better or worse? I think at the beginning it was difficult because there was no conformity and teachers were interpreting the standards differently. But today, with the Common Core, there is no question about what a third grader should know after completing that grade. However, I do agree that maybe some of the standards are not appropriate to that age level…but that’s another blog post! 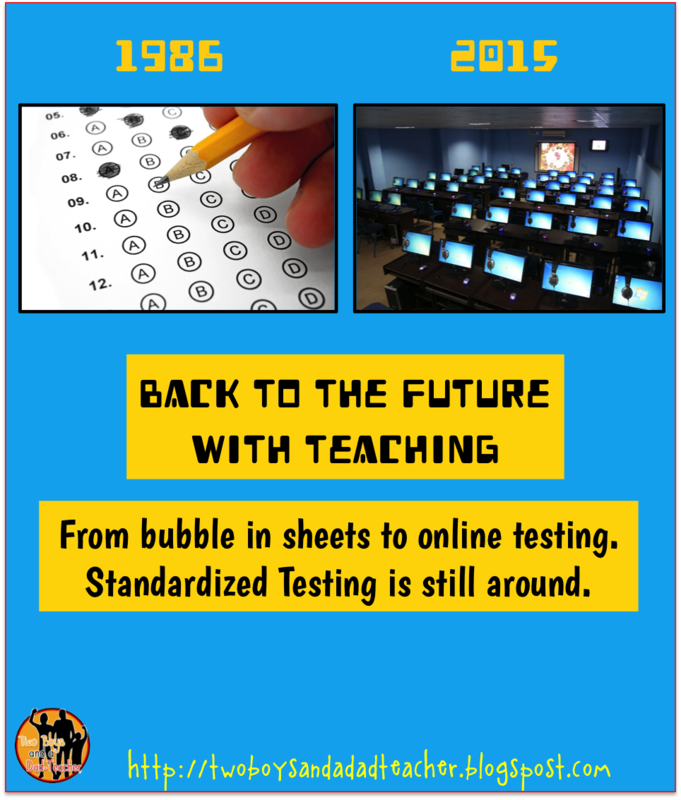 Even after 30 years of teaching, standardized testing is still around. When I started teaching in 1986, I remember the third graders had to take the CAP Test. I believe it stood for the California Achievement Test. It was part multiple choice bubble in, a writing test and a science performance task. It was hailed as a revolutionary test. I think it lasted 2 or 3 years. Then came the Stanford Achievement Test (the SAT for little kids). From there it only got worse as we transitioned to the California Standards Tests and now the CAASPP (some unwieldy acronym for taking the SBAC on the computer). When I look back, I don’t remember standardized tests running our world until about the early 2000s. That’s when California decided to rank each school using standardized test data as one of the factors (a BIG factor). I believe that is when teaching turned from educating little ones to teaching to the test. 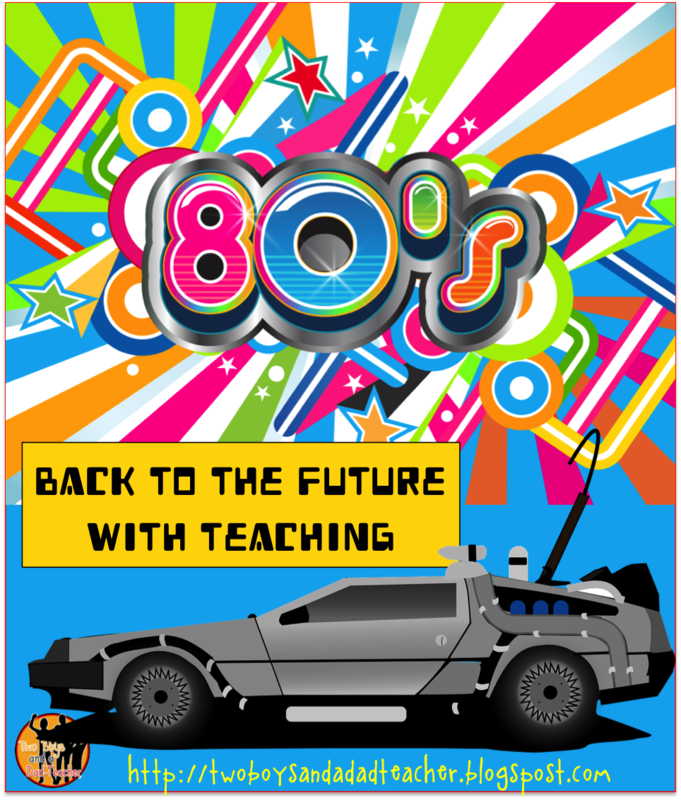 If I could go back in time with a DeLorean, I would certainly change that past and derail the standardized testing movement (by the way, a movement started by the standardized testing publishers — not teachers). Who remembers dial-up using AOL? There was no public Internet in 1986. I remember using dial-up in the early 90s on AOL. I did not get Internet access on a computer at school until the very late 90s. It wasn’t until he early 2000s that students finally got to use the Internet to mostly search (and then we discovered what happens when you entered Venus –like in the planet Venus– into Google’s search engine without filtering). Now, look at these kids! Students are using tablets, Chrome Books, laptops, desktops, even phones to do their homework, classwork and research projects. I blogged about using Google Forms HERE. As a teacher, how could I survive without the Internet! I’m using an online plan book, district email to communicate, Google Drive to access district tests and other forms, Google Classroom to manage online assignments, Dropbox to access all my teaching files, Power School to take attendance, and apps galore with my students. Taking attendance back in 1986 was done manually. At the end of the month, we had to complete a “register” which was a legal document to record the attendance for the month. It had this complicated formula for figuring out your attendance rate and we had to sign swearing that the information was accurate. Then the secretary would check it and send it back with all these errors which we had to fix. Now, I take attendance in 30 seconds and the secretary just prints out a form at the end of the month that I just sign. At least some things have changed for the better! Can you still smell the ditto fluid on your hands? Yeah, it was in the office and ONLY the secretary or principal could use it. It was strictly off limits to teachers. 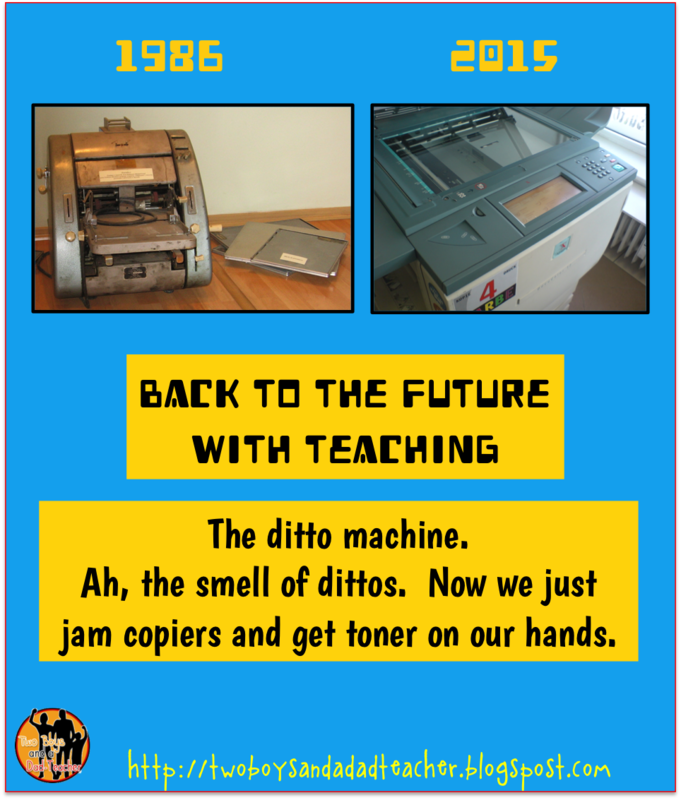 Teachers could not use the copy machine. Then how did we make our copies? Can you smell it? Yep, duplicating machines (ditto machines). Remember the scene in Fast Times at Ridgemont High? Good times. Yes, I had blue fingers, too. Now, we just put our copies into a machine the press a button and hope it doesn’t jam. I also believe that back in 1986, we were using a lot less copies since we were limited in paper usage. Seriously, today my small school will go through a box of 10 reams a paper in 2-3 days. I attribute the increase in paper usage to standardized testing. At least Google Forms will cut down on some of that paper use. By the way, you had to create your OWN ditto master to duplicate. Yes, you could type on the form, but any mistakes ruined the entire master and you had to start over. Sadly, this is something that has not changed. In fact, it has only gotten worse! Back in 1986, teachers were treated with more respect and our expertise, experience and knowledge was accepted. Today, politicians want to tell us how to teach while stripping away our right to organize and be fairly represented. But they’ve messed with the wrong people. We as teachers are fighting back. Look at the strength of the California Teachers Association (CTA). With CTA, we were able to get guaranteed funding through Prop 98. But around the country, teachers continued to be blamed for low test scores, drop out rates, bad itchy skin, high gas prices, cloudy days…ok, maybe not the last three. The attack on teachers will stop when we say enough and fight back. We have a great National Education Association (NEA) president who is doing just that and making it known that we need to Stop doing Stupid. We have to stand our ground together and collectively. Remember how fun and carefree teaching USED to be? I still have many more years of teaching left in me. I can adapt and like to try new things all the time. But I wonder about the new teachers entering the profession. They only know standards and standardized testing (they were probably being taught these standards and taking those tests as kids!). 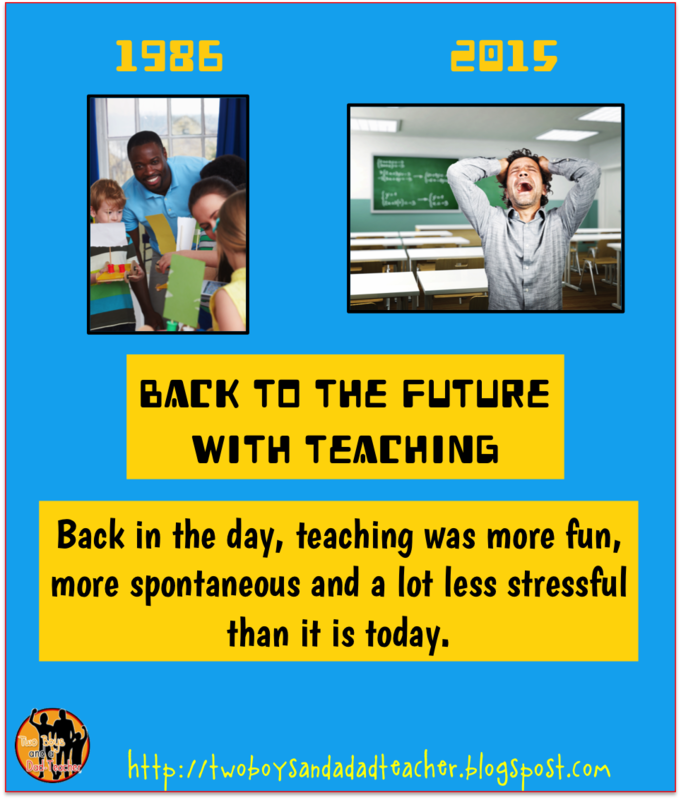 Do they really know how different…how more relaxed and fun…..teaching was back in the day? I definitely want to hear what changes you have seen in teaching. Share and comment below! 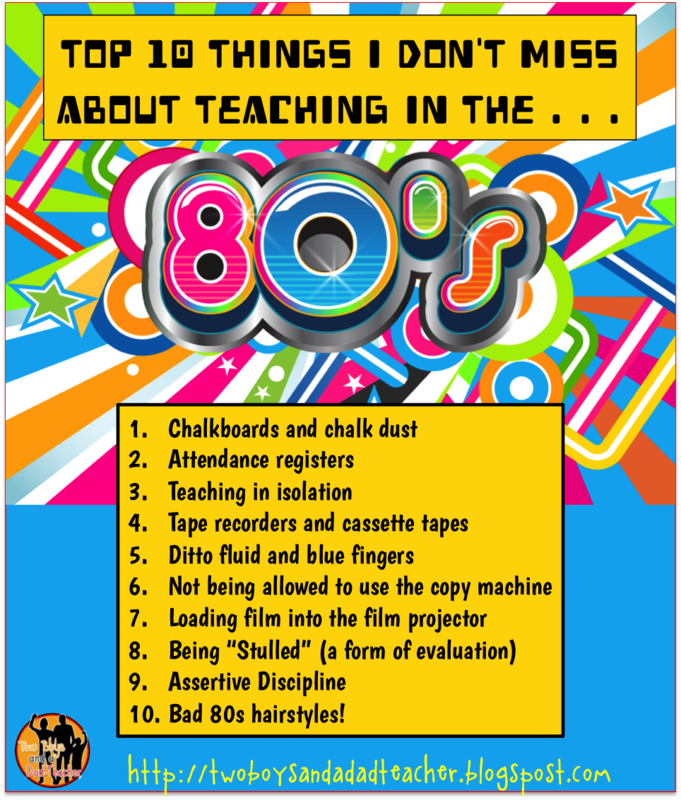 Until then, I leave you with my Top 10 Things I Don’t Miss About Teaching in the 80s!